Edmunds played 14 snaps in Sunday's 16-13 win over Cincinnati. Analysis: After spending most of the season on the practice squad, Edmunds was activated for the final four games of the season, reuniting him with his younger brother Terrell. The elder Edmunds played in three games -- exclusively on special teams -- and was on the field for a total of 44 snaps. He has three years remaining on his current contract. The Steelers added Edmunds to the active roster Tuesday, Jeremy Fowler of ESPN.com reports. Analysis: Edmunds was released by the Saints in early September before signing a practice squad deal with the Steelers a day later. He will now provide some extra depth at the running back position in Pittsburgh with Le'Veon Bell sitting out the season and James Conner's dealing with a leg contusion. Jaylen Samuels and Stevan Ridley sit ahead of him on the depth chart, but Edmunds' familiarity with the playbook should allow him to step in if needed. 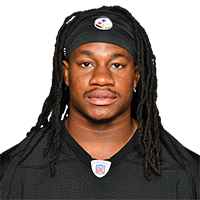 The Steelers signed Edmunds to their practice squad Wednesday. Analysis: An undrafted rookie out of Maryland in 2017, Edmund was picked up by the Steelers shortly after being waived by the Saints. Edmund received praise for his blocking and versatility throughout the offseason in New Orleans, and provides Pittsburgh with additional depth behind Le'Veon Bell, James Conner and Jaylen Samuels. Edmunds has been waived by the Saints, Josh Katzenstein of The New Orleans Times-Picayune reports. Analysis: Edmunds was a candidate to make the squad as a fullback, but the team opted to part ways with him to open a roster spot for the signing of Josh Leribiues. Edmunds will now likely be free to sign elsewhere. The Saints list Edmunds as their No. 2 fullback on the updated depth chart released by the team Monday, Luke Johnson of The New Orleans Times-Picayune reports. With Mark Ingram likely facing a four-game suspension, Edmunds could be in line for an expanded early season role. 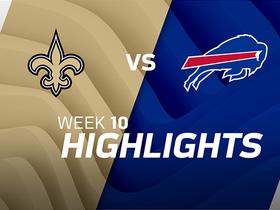 Watch the best plays from the week 10 matchup between the New Orleans Saints and the Buffalo Bills. 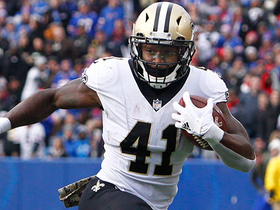 Catch the New Orleans Saints break a franchise record with six touchdowns in a single game. 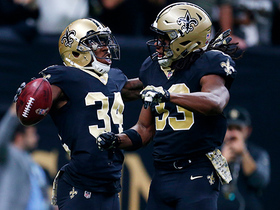 New Orleans Saints running back Trey Edmunds runs 41 yards into the end zone. 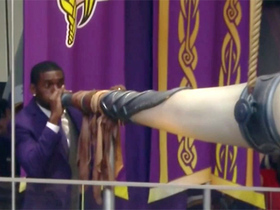 Vikings legend Randy Moss blows the Vikings' horn to open the game.